It can’t be stressed enough how crazy gravitational waves are. These supremely violent events take place many light years in the distance, and because they literally alter the shape of space and time, the ripples they produce can be detected on Earth. But gravitational wave astronomy is only in its infancy, and there’s even stranger things yet to be observed. To date, researchers have only spotted gravitational waves from colliding black holes and colliding stars—that’s what their detectors are set up to do. But new research demonstrates that within the next decade scientists may be able to spot a whole new kind of gravitational wave with a different tool called a pulsar timing array, or PTA. These waves would stem from pairs of black holes millions, even billions times the mass of our Sun orbiting one another like giants dancing and stomping in the distance. All of the headline-making gravitational wave events you’ve heard about were discovered by LIGO and Virgo, several-mile-long underground tunnels where laser light is split and then brought back together. A gravitational wave makes one of the split beams wobble and interfere with the other beam, making a wave shape visible in a detector. But these detectors can only spot wobbles occurring at least 10 times per second—they’re immune to less frequent ones that might be created by things such as merging galaxies with a pair of orbiting supermassive black holes at their center. PTAs take advantage of the regular arrival times of radio pulses from millisecond pulsars to search for gravitational waves. When two supermassive black holes coalesce into one, the mergers bathe the universe in low-frequency waves, stretching and squashing the fabric of spacetime. The pulsars and the Earth behave like buoys on the surface of a choppy spacetime sea, bobbing up and down as the waves pass by. This causes changes in the timing of pulsar pulses that can be detected in carefully designed experiments here on Earth. But Mingarelli’s model, published yesterday in Nature Astronomy, used real data to predict how many and even which galaxies would radiate these waves. “Before, everyone used simulations that couldn’t tell you which galaxies to look at specifically,” she told Gizmodo. 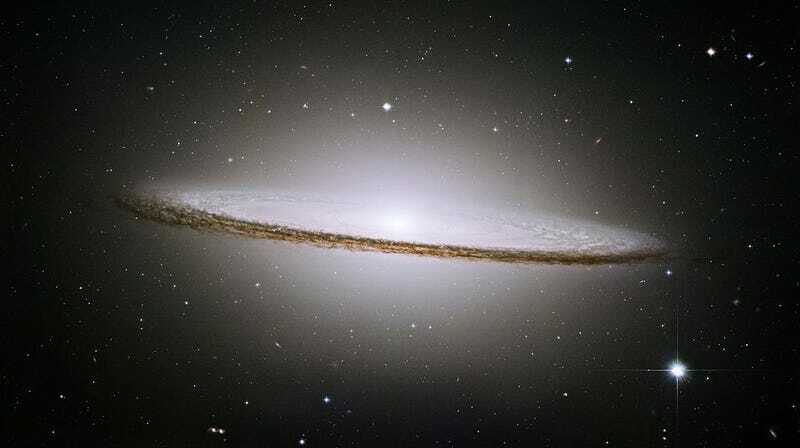 “But using my techniques with theoretical galaxy merger rate, we can point to galaxies in the sky and say ‘that one.’” In this case, the most likely merger is M104, the Sombrero Galaxy. That’s because if it had these binaries, they’d orbit each other for a longer period of time and would therefore be more likely to spot. Ultimately, the discovery of such a gravitational wave will depend on how well the researchers can isolate ambient noise; finding the signal in the noise is something the prediction is reliant upon. Mingarelli also wants to tweak the model to improve how the laws of the Universe affect these galaxy merger rates, since ultimately discovering these waves relies on finding the right galaxy. With this ten year prediction, it’s now just a game of wait-and-see.